An adventure for 3rd-level Pathfinder Roleplaying Game characters. Razmir the Living God used his power to conquer an entire country; now he and his mask-wearing priests enforce peace and generosity—though some say their tools are intimidation and fear. His worshipers preach charity and self-worth, blaming rival faiths for crafting lies about the glories of the Living God. Now the cult has come to the city of Tamran, feeding the poor and promising happiness to those who serve Razmir. Yet ugly rumors persist of bribery, extortion, and strange disappearances associated with the new temple. Are these stories just gossip and lies spread by rival faiths? Or is the church of the Living God more than it seems? 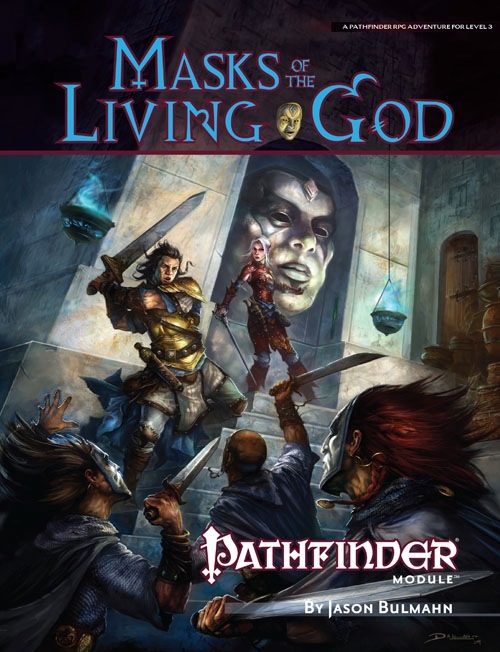 Masks of the Living God is a adventure for 3rd-level characters, written for the Pathfinder Roleplaying Game and compatible with the 3.5 edition of the world’s oldest RPG. This city-based adventure involves infiltrating a fortified temple and exposing the evil deeds of its cultists. This adventure is set in the wooded land of Nirmathas in the Pathfinder Chronicles campaign setting, but can easily be adapted for any game world. It can be used as a sequel to Crypt of the Everflame or as a stand-alone adventure, and is a prequel to the adventure City of Golden Death. Pathfinder Modules are 32-page, high-quality, full-color, adventures using the Open Game License to work with both the Pathfinder RPG and the standard 3.5 fantasy RPG rules set. This Pathfinder Module includes four pre-made characters so players can jump right into the action, and full-color maps to enhance play. 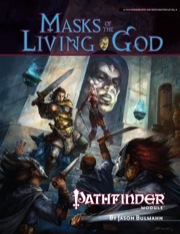 Masks of the Living God is sanctioned for use in Pathfinder Society Organized Play. Its Chronicle Sheet and additional rules for running this module are a free download (217 KB zip/PDF). Infiltrate, blend in and get revenge! My previous review got eaten or misplaced. Since that bothers me, Il'l just give a brief summary of my opinion this time around. This module consists of two distinct parts. The first part focuses on infiltrating a cult and blending in. It requires a lot of roleplaying, which given the tasks and potential punishments is extremely fun to do. The second portion is all about escaping, shedding blood and taking revenge. After being tormented and possibly brainwashed, that’s a nice change of pace and, at some points, was rather challenging. Overall this was a highly successful and fun module, something I hope to see more of in the future. This is what I call a fake linear adventure. That is not a bad thing in the right hands. To get the true taste of the adventure the DM needs to make sure the players fall into line wirh what is going on. If players fight it very hard, or the dm ignores possible options it can take a great deal from the adventure. Once you are on the advenutre train there are many many many side trips that can have little effects on the game later, and that is awesome. This is a great adventure too get the PCs to really roleplay their characters and get into their emotions. A decent DM can push buttons on PCs and then give them the opportunity to strike back against that. A nice 2nd offering in a short newbie-friendly campaign. I ran this as a sequel to Crypt of the Everflame in my first campaign as a DM, and I found it to be a mice step up from the first. While I quite liked the first module, I found the adventure to be a bit easy and the dungeon to be not that fun to explore. This one, however, was a lot better. Introducing new players to the idea of thinking laterally instead of brute force "BREAK DOWN THE DOOR AND KILL EVERYTHING!" is important, and the module does that quite well.It even has some interesting stuff going on with stealth and potential sabotage. Plus, unlike the first, there's a decent bit of challenge. My only real complaints come down to the setup of the module if it's being used as a sequel to CotE. To be honest, the connection between the two is kind of loose. As a DM it's probably in your best interest to rewrite the connection a bit to make it stronger. The other issue is convincing players to get on the boat to get to the city, which some of my players were against doing. Other than that, I highly recommend it, for both teaching new players and teaching yourself to be a DM. I have reviewed this book over on RPGGeek.com. I'm glad to know we'll hear more about Razmir - will we find out much about his church in this module? The blurb says that this module highlights the changes in the Pathfinder RPG. How easy is it to run this adventure under 3.5? I suspect that PF RPG adventures will be about as easy to run in 3.5 as a 3.0 adventure is to run in 3.5. Will there be a flip mat for this adventure like there was for Crypt of the Everflame? Nope; we have no plans to make a flip mat of this adventure's locations, mostly because there's too many different locations to make into a single flip mat. I too am looking forward to this. Shame it's going to follow so long after CoE, which we are half-way through (it's a two-session module at our pace). So this comes out in November, and it is a sequel to 'Crypt of the Everflame'? And Carrion Hill is a sequel to this one? Or is my half-fiendish dwarven brain failing me again? City of Golden Death is the sequel to this one. So it seems that Crypt of the Everflame has proven a success, so the party will progress to Masks of the Living God (MotLG). I have done a quick calculation and for a party of 6, they should earn XP to take them a little way into 2nd level. MotLG, however, is a 3rd level mod. I was sure I had read something about this and how one was advised to bridge the gap but have failed to find it - anyone know the answer? If another Pathfinder Module was slotted in to get more XP but taking them beyond 3rd, would MotLG become drastically too easy or still be a good challenge? There's a bit in the early part of MOTLG that says, "This is for 3rd-level characters, if your PCs aren't 3rd-level yet, here's a good place to add some random encounters to get them up to 3rd." My group (coming from a string of bad experiences with a certain RPG currently on a version between 3.999 and 4.001) absolutely blew through Crypt of the Everflame - loving it the whole way, of course. We don't play often, once a week for about three hours at a time, but we're completely done with Crypt and thirsting for more to do. I am creating side quests, etc. to fill in the space between these modules, but...I guess my question is, is there commonly going to be months between module releases? I would have hoped that one would run into the next as seamlessly as possible, but I'll be lucky if they are only third level by the time December gets here. Pathfinder Modules are on a bimonthly release schedule. You sound like a good candidate for Pathfinder Adventure Paths! ...which are all kinds of awesome. As I love the classic idea of an archmage who tries to pass himself off as a deity, I can't wait to get this one! Can't you make that Buhlman guy work a bit faster? James, you should consider taking Exotic Weapon Proficiency (Whip) -- trust me, it's well worth it (and lots of fun at Chelaxian parties!). I really like this cover. It's city-based, so the city flipmap might work? At first glance, some of the encounter maps in the adventure are pretty close to some of the buildings in Flip Mat: City Market, so that is doable. The Razmiran temple, however, is quite customized and I don't think there's anything like it on any of the flip mats. I'm a bit confused about the background of this adventure. From the description, it seems that not many years have passed since Iramine was separated from Kassen and Asar, but according to the introduction of Crypt of the Everflame, Kassen died in 4535. I think the unclearness comes from the use of "soon after," which could be interpreted as "soon after the adventurers split the key, Iramine heard that..." but you should interpret it as "soon after Iramine's superiors tasked her with retrieving the parts of the key, Iramine heard that...." If I had the option, I would rewrite that sentence because it presents the weirdness you're talking about. Keep in mind that Razmir didn't found his country until 4661, so over 100 years passed between Kassen's death and the creation of the cult of Razmir, and thus Iramine could not have told senior Razmiran priests anything about the city (because the cult didn't exist yet). Thanks for the clarification. Part of confusion was also due to the fact that the sentence continues with "Iramine learned that her past associates were both dead,...". and in the present year, it's obvious that both men would be dead. Now I understand that the meaning is that Iramine learned that Kassen and Asar killed each other while fighting for the key (and thus she could surmise that their pieces might be buried with them). I don't suppose there's a map of Tamran anywhere? Or maybe some more details about the city? I have enjoyed reading Mask of the Living god. I like the cult of Razmir as villains. From reading the module they seem to operate almost like a thieves guild with protection (tithing) rackets and so on and so forth. As I looked through all of the NPCs I noticed there wasn’t a single cleric. I have one thought. Wouldn’t a lack of clerical magic be a tip off to people that something wasn’t quite right with the cult of Razmir? What are your thoughts? Me and WanderingNephilim were having that same discussion the other day, after he purchased this mod. I love the idea of a thieves guild posing as a church, and was thinking for anytime they needed showy spells they could rely on good old fashioned Use Magic Device and Scrolls or wands. That's my take though, they probably are just faithful "acolytes" and the actual priests are busy or some such, or at least thats what theyd tell people. ElyasRavenwood, I fixed your spoiler tag. Click "Show" at the bottom of any post as you're writing it to see the BBCode tags and their use. A wand of cure light wounds + Use Magic Device skill takes care of a lot of this, as does a Razmiran magic item from Gods and Magic. Do you have a suggestion on a good map to use for the city of Tamran? Joshua Thank you. Hopefully i'll get the hang of putting text behind a spoiler button sooner then later. Stewart, the use magic device could work as well. that sounds like a good idea. Sean, that sounds like a good idea, thanks for taking the time to answer my post. I will go look up that little something in gods and magic, you have piqued my curiosity. There's nothing particularly unique about Tamran; you could use just about any small lakeside city's map--even of an Earth city. Or build one with Map Tiles or Flip Mats, if you have those. I expect most of this to be baseless propoganda, meant to make the great Razmir look bad. Anyone happen to have done the grunt work of advancing and giant-izing the critter on page 20 of the mod? Well, I took a bit of SKR's advice and created my own map for Tamran using Campaign Cartographer and based on some of the physical descriptions I found. I'm not the best with that program, so the map is kind of primitive, but if anyone else wants to use it, just let me know and I'll try to convert it to a jpeg or pdf and send it to you. Can you post a link here? I'll see what I can do, but I'll warn you now, my computer-fu is not as strong as some folks around here. Either way, it'll have to wait until later this evening when I'm home. I'm about ready to start running Masks of the Living God, myself. My group loved Crypt of the Everflame and we're looking forward to heading off to Tamran. One thing, though...does anyone have any good images of Razmiran cultists, or know where I might find some? The ones in the module are okay, but I'm looking for something I can use for counters and there aren't many options in the book. the paladin was the last man standing, but it was a close fight between him and the party rogue. the players had a great time with this one. Very nice shots! LCD projector overhead shooting on the table-top? Did you anything special to the table to keep image clean? Table-cloth, etc? I'd love to do something like this if I had a regular gaming group. Yep. See this thread for the technical discussion of the rig. I'm projecting onto reflective cardboard cut-out thing I bought from home depot (couldn't find it searching their site...sorry), which I wipe down with water and soap every couple of months. Thanks for the information. I'm an AV guy by trade, most of the idea and equipment is something I've mapped out. But I was wondering about surface. I had tested it out with A matted table cloth, but short of taping it it isn't very permanent. So, thanks for the info. So when is Razmir going to bring in the Celebrity endorsements..like from a short permanently grinning actor/bard..not that the Cult of Razmir is in anyway connected to certain real world cults off course..
We take great offense at being compared to a man with an enormous schnozz. Don't you see the masks? Heave to and prepare to be sued for libel! AHHH.. GO TAKE 31 STEPS OFF A SHORT PIER MATEY!! !